Louise Fishman, Untitled, 2011, acrylic on rusted metal, 1 1/4 x 8 1/2 x 7 1/4 inches. Courtesy the artist and Cheim & Read. Louise Fishman 1Louise Fishman 2Louise Fishman 3Louise Fishman 4Louise Fishman 5Louise Fishman 6The Institute of Contemporary Art (ICA) at the University of Pennsylvania is pleased to show an unusual look at the work of Louise Fishman. Highly regarded for abstract paintings with an athletic reach of scale and gesture, Fishman has long been occupied with the potential that small scale and sculpture hold for her art. Focusing on these less-known aspects, Paper Louise Tiny Fishman Rock concentrates other intimate and potent concerns: the artist’s Philadelphia roots, her feminist and queer politics, Jewish identity, friendships with Agnes Martin and Eva Hesse, and her meditations on the grid. This exhibition will be on view from April 29 through August 14, 2016 in ICA’s Edna S. Tuttleman Gallery. Paper Louise Tiny Fishman Rock presents a selection of sketchbooks, miniature paintings, and small sculptures. Not much bigger than two inches by three inches, the miniatures are as completely realized as full-breadth canvases. The sculptures, some cast in bronze from plaster models, have been constructed largely from found objects, are so elemental in form and substance they appear almost geologic. And the books, which are filled with mediums and modes of mark making, burst with narrative drive like Amazonian comics rendered abstract. There will also be some very early works, including a self-portrait of the artist as a blonde boxer. Based in New York since the 1960s, Fishman comments on her formative development and involvement in the feminist movement, in which she was an activist for gay rights: “Franz Kline and Willem de Kooning were big for me—Joan Mitchell too. Then Minimalism came along and I was looking at Sol LeWitt and making hard-edge grid paintings. My group encouraged me to see that everything I was doing as a painter— even using stretched canvas and a paintbrush—was male, and this was problematic. I always hated women’s work—growing up first a tomboy, then an athlete, I never sewed.” The ICA exhibition shows how Fishman attacked these problems and, in the process, granted herself permission to paint on the heroic scale with the freedom she now possesses. 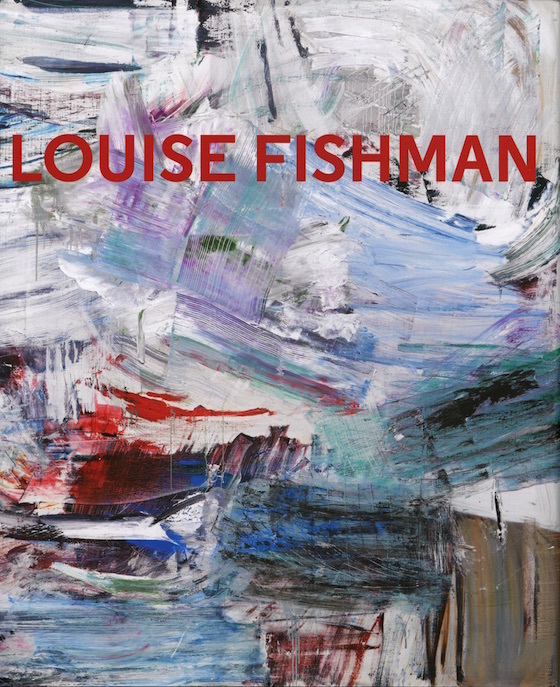 The ICA exhibition takes place in tandem with Louise Fishman: A Retrospective, a fifty-year survey of Fishman’s art at the Neuberger Museum of Art, State University of New York, Purchase. Relative to this comprehensive painting show, Paper Louise Tiny Fishman Rock is conceived as a studio visit: a chance for viewers to see bodies of work that represent a largely private practice. Including some of the objects Fishman has collected over the years, as well as other surprises, the installation was composed in close collaboration between the artist, curator Ingrid Schaffner, and ICA preparator, artist Paul Swenbeck. Paper Louise Tiny Fishman Rock is organized by former ICA chief curator Ingrid Schaffner, currently Curator, 57th Carnegie International, 2018, Carnegie Museum of Art, Pittsburgh. The exhibition is accompanied by a major monograph,co-published by ICA with Neuberger Museum of Art and DelMonico Books/Prestel. It features a curatorial essay by Helaine Posner, Louise Fishman: The Energy in the Rectangle; essay contributions by Carrie Moyer and Nancy Princenthal, and an interview with the artist by Schaffner. Fishman’s art has also been closely followed in Philadelphia over the years: in 1993 three simultaneous exhibitions, with a publication by Judith Stein, explored distinct aspects of her work. 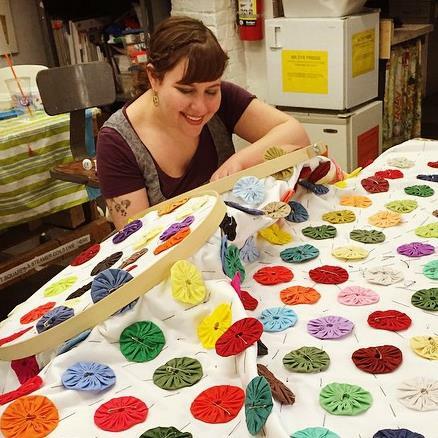 In 2013 the artist examined her own legacy in relation to the work of her mother Gertrude Fisher-Fishman, and her aunt Razel Kapustin—both painters—in an exhibition at the Woodmere Art Museum. Support for Paper Louise Tiny Fishman Rock has been provided by the Edna W. Andrade Fund of the Philadelphia Foundation. Additional funding has been provided by Cheim & Read, Arthur Cohen & Daryl Otte, Marjorie & Michael Levine, Josephine Magliocco, Amanda & Andrew Megibow, Christopher Schlank, and Susan J. Weiler. Louise Fishman, Untitled, 2011, acrylic on rusted metal, wire, 8 3/4 x 5 1/4 x 2 inches. Courtesy the artist and Cheim & Read. Louise Fishman, Untitled, 1993–94, acrylic on cast bronze, 5 1/4 x 4 1/2 x 8 inches. Courtesy the artist and Cheim & Read. Louise Fishman, Untitled, 1993–94, plaster on corrugated cardboard, staples, 3 x 4 x 4 1/2 inches. Courtesy the artist and Cheim & Read. Louise Fishman, Untitled, 2007, acrylic on carpet sample, 6 x 5 5/16 inches. Courtesy the artist and Cheim & Read. Louise Fishman, Untitled, 2011, oil on canvas, 2 3/4 x 2 3/4 inches. Courtesy the artist and Cheim & Read. Paper Louise Tiny Fishman Rock, 2016, installation view, Institute of Contemporary Art, University of Pennsylvania. Photo: Constance Mensh. Rita Jules, Miko McGinty Inc.